WILL Miss Matty find romance in the second of two new Cranford films? “She deserves a bit of happiness,” I suggested to Dame Judi Dench – the woman who plays her. “You reckon,” replied Judi, with that trademark twinkle in her eye. “Well quite. And about bloody time. Poor old Miss Matty. “She starts to have a really nice time. Wait ‘til Cranford 3,” she laughed. Cranford: Under the bonnet and not forgetting Cranford Christmas. But there was a large amount of material from interviews with the cast and production team which simply could not be squeezed in. Have the production team had any feedback from actors whose characters were killed off in the original serial? Filming in Lacock – how did the locals react? Director Simon Curtis: “By and large they were very supportive. It’s quite a disruption to them because we put all the ground cover down and close streets off and they can’t park. But I think the majority of them are very proud of their village, rightly so, and proud that Cranford celebrates it. Renewed interest in Elizabeth Gaskell’s books after the first series? Did you think the Cranford ladies would return to the screen? “I thought we weren’t going to see them again. With Barbara Flynn (Mrs Jamieson) many years ago I’d done Wives and Daughters. Barbara and I played the sisters in it. 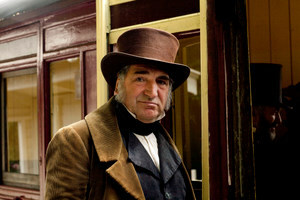 And we got a taste then of the sort of life that is depicted in Cranford and realised the potential of those characters. That’s why I wanted to do it. Simon Curtis: “I like to think of myself as the kind of director who goes to the material and, frankly, Cranford has such a distinct tone and such a distinct flavour, my job is just to capture that and not be fussy. Some directors, I think, try and be noticed and I try not to be noticed. There’s so many faces, so many people to be noticed. Every scene has a wonderful prop or a stunt or an animal. It’s all of that. Do you think the ladies of Cranford could come back for one final, third outing? Can you compare Cranford and Lark Rise To Candleford? “It’s easy to say that actors are egocentric. Yes, I suppose we are. It’s easy to say that they’re very envious and there’s a lot of back-biting. I find actors are so supportive of each other, I can’t begin to tell you. When I took over Marple I had letters of support from actresses who could have played the part easily. And this is one of the things in this company. We are all so supportive of each other. And just generally actors are. We’re always portrayed as luvvies. The 1803 Victorian child rearing manual she “procured” as part of her research when writing the script? “I was reading it and I thought, ‘Oh, this is marvellous.’ They’re saying, let your child walk about in its bare feet in the house and don’t put tight clothes on it. I was thinking, ‘This is a lovely way to bring up children.’ And then it said, ‘Should your child misbehave, give it poppy water.’ Which, of course, is opium. So you realise they’re on opium to calm them down. “And also if your child tries to walk too soon…children were discouraged from walking before the age of 18 months because it would give them bow legs, ‘Put both the legs in one long stocking.’ So I try and pick up all the little things like that and put them in. “I’d enjoyed the first series very much and it was a bit ambivalent about whether I wanted to be in the sequel because they’re often not as good as the first ones. And then I read the script and I thought it was an excellent script, great character, and was very happy to be a part of it. “It was billed in the rehearsal schedule that we’d have etiquette lessons. And I thought, ‘That’s going to be boring.’ But it was wonderful, actually. That, again, was a bonding experience. The way people were possibly more physically open than they are now, the social interaction was different. When you met people on the street, the men would bow and all that kind of stuff, and keeping a certain distance from each other. That was really interesting to do. “It was all to do with etiquette. I think that was a major thing. We had quite a few lessons on etiquette. That’s obviously so different to now – who you bow to, how you bow and who you say hello to and who says it first. And stuff like horse riding, for a girl to ride a horse like a guy was incredibly alien. The etiquette just went out the window. So you did it in the privacy of your land but you’d never enter a town like Cranford because all the gossips would be going like the clappers. “It’s quite hard because I’m incredibly lazy with my posture, elbows on the table and so on. It helps for the women because it keeps your posture right. You don’t realise how often, as myself, I speak using gestures quite a lot and you just didn’t do that then. Your hands are usually placed on your lap. You’ve got to think outside of yourself. The wrap party at the end of filming? What was your contribution to cake day? “I stick with the women. 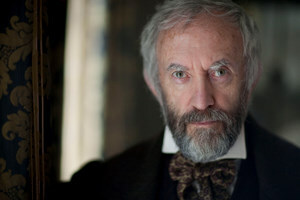 I was furious when Jonathan Pryce (Mr Buxton) turned up. These are my babes, get out of it, Captain Brown’s here. Sling your hook. 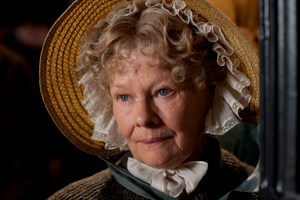 And Judi Dench is not averse to a bit of a laugh, so we did chuckle a lot. Could there be yet more Cranford? 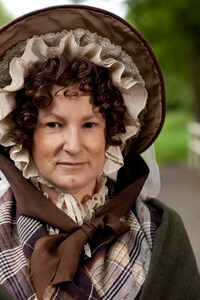 *The second and concluding Cranford 2009 film is on BBC1 at 9pm this Sunday (December 27). Posted in News and tagged Cranford, Dame Judi Dench, deborah findlay, elizabeth gaskell, Imelda Staunton, Jim Carter, jodie whittaker, jonathan pryce, Julia McKenzie. Bookmark the permalink. Really interesting post; I always love reading interviews and hearing feedback from production staff. I particularly enjoyed the Eileen quote! Will you be covering Larkrise to Candleford next year? Thanks Lizzy – sadly, have no interviews to go with the third series of Lark Rise To Candleford, which begins on BBC1 at 8pm on Sunday Jan 10.